The Society for Nature ″Education and Health (SNEH), a voluntary organization, observed the ‘World Non-Violence Day and Gandhi Jayanti’ here on Monday. 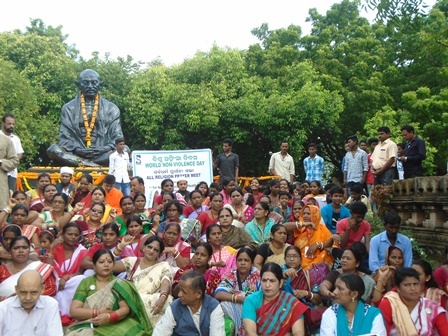 On this occasion, SNEH organized an all religion prayer meet at Gandhi Park near Janata Maidan. Representatives from different religions like Hinduism, Christianity, Islam and Budhism participated the program and offered prayer for peace and harmony in society. All of them exhorted the gathering to shun violence and follow the preaching of the father of the nation Mahatma Gandhi. The program concluded after offering of floral tribute to Gandhiji. Many youth from Salia Sahi slum, women leaders and civil society members participated in this event.